Glaucoma is characterized by increased intraocular pressure as a result of compromised intraocular fluid overflow. 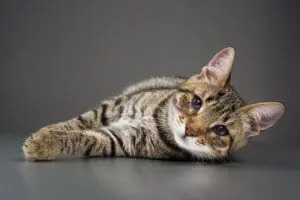 If your pet is developing glaucoma you may notice increased tearing, squinting, ocular redness or cloudiness, enlargement of the eye(s), a tendency to rub the eyes, drooping of the eyelids, compromised vision, and decreased appetite and energy levels. However, these are generalized signs of ocular pain, and are not necessarily specific for glaucoma. Your veterinarian or veterinary ophthalmologist can diagnose glaucoma by measuring your pet’s intraocular pressure using an instrument called a tonometer. The eye produces intraocular fluid, or “aqueous humor,” that flows through the eye, then drains. In a normal eye, aqueous humor production and draining is constant and equal. In glaucoma, the outflow drainage pathway is obstructed. Since the aqueous humor production is constant, the rate of the fluid production is higher than the rate of fluid drainage. Since the eye is a closed space, constant filling with compromised drainage will lead to increased intraocular pressure. Glaucoma is a progressive condition, meaning it has a natural tendency to worsen over time. When uncontrolled, glaucoma is both painful and potentially blinding. It is therefore critical for your pet’s well being that they receive glaucoma therapy. All glaucoma cases benefit from receiving topical glaucoma medications (eye drops) as soon as possible. Any additional therapy will depend on whether or not the glaucoma is primary or secondary. This means the condition is a result of abnormal anatomy. Specifically, the iridocorneal angle – the opening of the ocular outflow pathway – is too narrow. This is called “goniodysgenesis.” It is presumably inherited and known to occur in certain breeds including basset hounds and cocker spaniels. It is almost always bilateral, meaning that it affects both eyes. In affected animals it is present from birth, though true glaucoma typically develops years later. Goniodysgenesis is similar to narrow-angle glaucoma in humans. The diagnosis of goniodysgenesis is made by gonioscopy. This is a test performed by veterinary ophthalmologists using a lens called a “goniolens.” After numbing the surface of the eye, ophthalmologists place the goniolens on the eye, then look through it using a handheld microscope to view at high magnification the anatomy of the iridocorneal angle, the fluid drain. The eye condition is most likely localized to only the eyes (as opposed to secondary to a systemic disease). Both eyes are likely to develop glaucoma, and therefore, both eyes will benefit from glaucoma medications as soon as possible. This means that the outflow pathway has become obstructed as a result of another condition. The other condition is usually uveitis – or inflammation inside the eye. Uveitis is often associated with a systemic condition such as an infection, an autoimmune disease or cancer. Albeit relatively rare, intraocular tumors can cause glaucoma by physically blocking the aqueous humor outflow pathway. If your pet has signs of secondary glaucoma – either signs of uveitis, a tumor, or a lack of goniodysgenesis, then the treatment for glaucoma will involve both glaucoma-specific therapy as well as therapy for the underlying cause. As mentioned above, all glaucoma cases require glaucoma medications in the form of eye drops. Therapy beyond that depends on whether or not the eye is still visual. If so, then surgery may be considered with the aim of maintaining vision and comfort for as long as possible. If not, a salvage procedure to help restore long-term comfort should be considered. One way to relieve the pressure of glaucoma is to try to restore the balance between fluid production and fluid drainage. Remember, it is the drainage that is compromised. We can try to slow the rate of fluid production by “ablating,” or shutting-down, the tissue that creates the fluid – the ciliary body epithelium. Laser energy can be applied to the ciliary body epithelium to ablate it. Another way to restore the balance between fluid production and fluid drainage is to provide an accessory drainage (fluid outflow) pathway. This can be accomplished by placing a “goniovalve.” A goniovalve is a device that shunts fluid from inside the eye to the tissue space surrounding the eye. From there the fluid is naturally absorbed by the body. If your pet has an eye that is already blind from glaucoma, then a salvage procedure should be considered to restore long-term comfort. Salvage procedures are meant only for blind eyes, as they are irreversible procedures aimed at restoring comfort (not vision). 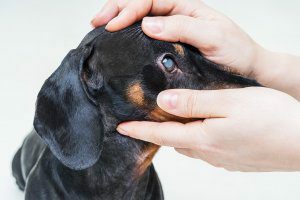 Though they may seem drastic the first time you learn of them, rest assured that pets with blind and painful eyes are simply much happier once the pain is relieved. This is evidenced by a rapid return of their energy levels and appetites. Most owners report that their pet is back to their “usual self” or even “like a puppy again” within days after a salvage procedure. In addition, the permanent glaucoma relief means your pet will no longer need glaucoma medications. Intrascleral prosthesis: This is also known as “evisceration-prosthesis.” The inner contents of the eye are removed and replaced with a prosthetic, allowing your pet to maintain the appearance of their eye. Enucleation: This is removal of the entire globe (eyeball), followed by permanent closure of the eyelids. This dog has both an intrascleral prosthesis and an enucleation. 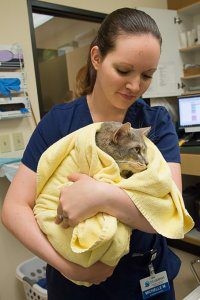 Which salvage procedure is best for your pet is largely a matter of personal preference. While the intrascleral prosthesis allows for a more cosmetic appearance, there is a slightly higher chance of complications that may require future therapy. Your veterinary ophthalmologist can discuss with you in more detail the pros and cons of these procedures.